Once again we had a good attendance. There were about more than 55 out of 100 registered. 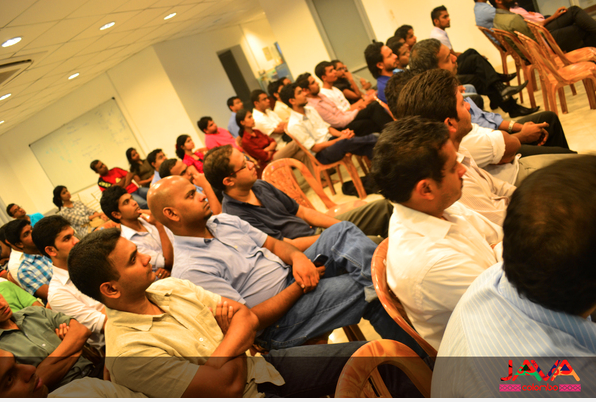 Also by this meetup Java Colombo exceeded 300 subscribers and became the most active Meetup in Sri Lanka with the highest number of members. Keynote was done by Hiranya on "Handling I/O in Java". It was the best keynote we had in Java meetups so far and was very well received by the audience. Take-away for me from the keynote is - "Hiranya's laws on I/O handling" :-). He came up with a nice set of best practices and things to avoid while doing I/O programming in Java. Hiranya has already blogged about this and can find his slides from here. After the keynote we had the panel discussion on "Web Services with Java". Amila and Hiranya joined the panel and I had the privilege of moderating. We started by talking about the building blocks of SOAP based web services, like SOAP, WSDL and UDDI. Then we talked briefly how to develop web services with Axis2 - where Amila also demonstrated by a sample. Further we discussed WS-Discovery and how it makes discovery less complex with respect to UDDI. REST was also another focused topic during the discussion. Hiranya explained concepts associated with REST and explained how it differs from SOAP - when to use SOAP and when to use REST. Also we discussed limitations in REST and it's coupling to the underlying transport. Discussion finally ended up by talking about how to secure SOAP and RESTful services - where we talked about transport-level security and message-level security. All-in-all it was successful a meetup and need to thank everyone who supported. Specially need to thank WSO2 for continuously sponsoring meetups.